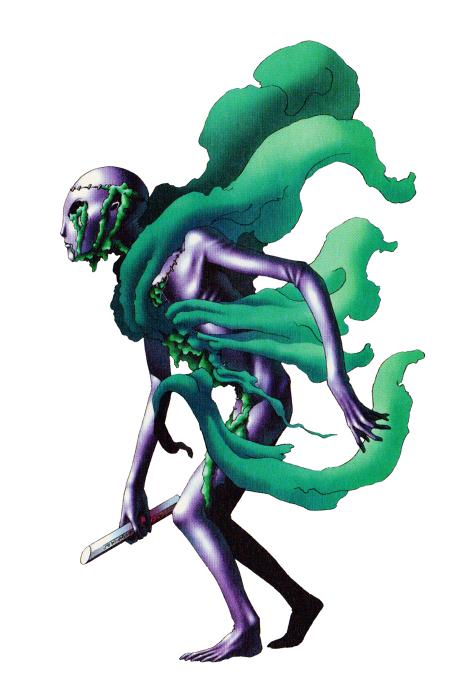 We're looking at a slew of demons from the Megami Tensei series this Halloween season, thirteen at a time, in no particular order, and special thanks to Eirikr for providing both high-quality scans of several monsters and tons of additional information; be sure to visit the blog for more detailed analyses of individual SMT creatures! The idea of a classic-style extraterrestrial visitor becoming a zombie is one I think is actually pretty effective. These are beings we usually associate with high intelligence and advanced medical technology, so it's pretty scary when they can succumb to some sort of zombie plague. I like how its still clutching some sort of alien device, too, like it still has some dim memories of whatever it was supposed to be doing or it's simply been sent on an errand by its zombie master. The latter seems more likely, since its in-game description calls it a victim of "primitive shamanism." It's a magic zombie, not a virus zombie! That's even better! 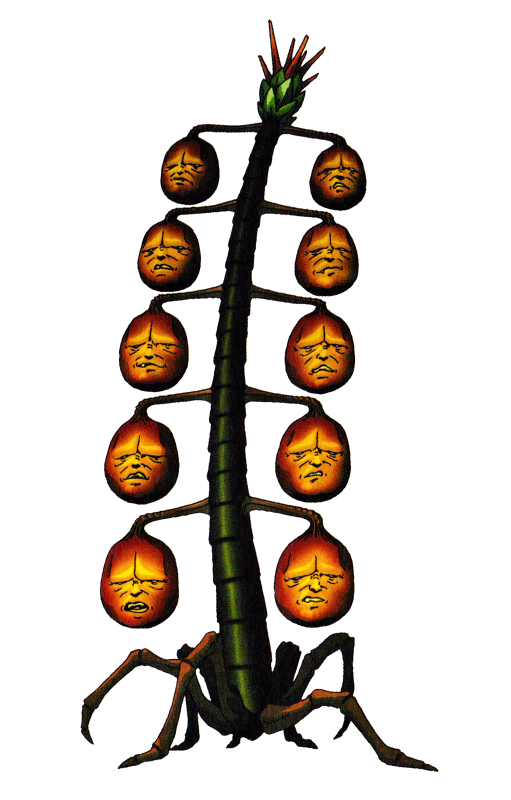 This demon is actually based on something from the Qu'ran; a tree that grows in hell, with fruits resembling hideous faces. The damned are said to become so hungry that they willingly eat these fruits, even knowing that within moments, the fruits will "boil like molten copper" inside them and even tear their bodies open. According to one prophet, the tree is so toxic that a a single drop of its sap could pollute the world's oceans and bring ruin to all humankind. 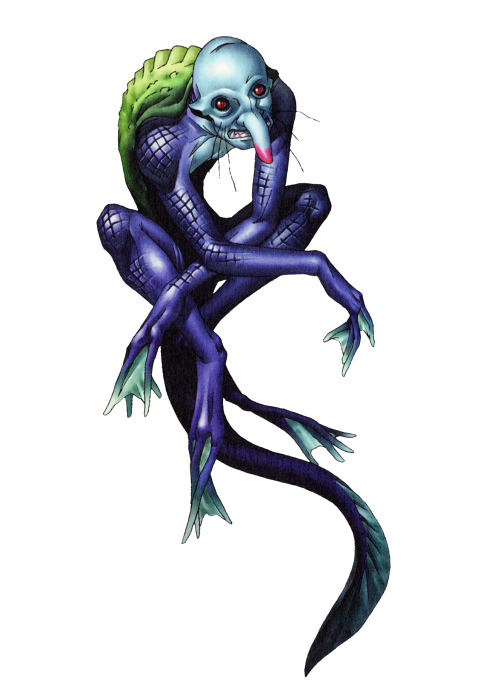 This makes it all the funnier that you can just be this thing's friend in Megami Tensei. It isn't usually considered a being in its own right, but here they've decided it should have cute little legs. I also like its segmented, stalked appearance, a more exotic looking plant than the more conventional, deciduous tree shown in old paintings. Coming to us from Ireland, Balor is a mythical, giant cyclops whose eye destroys everything it sees when he uncovers and opens it. In one tale, he wears a layer of seven cloaks covering his face, and taking off just one of them causes plants to wither. A bird cage obviously doesn't solve this problem, but the idea of a cyclops monster with a cage for a head, housing its mobile little eyeball, is one of the most ingenious creature designs I have seen in my life. I don't even know what else to say about it. They win. In Slavic folklore, the Kikimora is a female house spirit often more malevolent than the relatively peaceful Domovoi, though sometimes, the two were said to arrive in homes as a married couple. Messing with household objects as they pleased, cooking their own food in the host's kitchen, leaving terrible messes and throwing tantrums when the house isn't kept clean and tidy by everyone else, the Kikimora usually only lived as a supernaturally lousy roommate, but in some tales, might cause sleep paralysis or even death. All of this is only made kind of creepier by how innocent and cute the creature looks in its most famous, 1938 illustration, which is pretty much lifted directly and colorized by Megami Tensei. I just love the idea of this twiggy, mousey-eyed little old lady living in someone's cupboards and repeatedly ruining their sink. In more modern tales, the Kikimora will apparently mistake any warm electronic device for something it can cook its food with. Oh no. So here's another Slavic one already, a type of water spirit possessed of immense power as long as it is submerged, and significantly less power if it's just really wet. 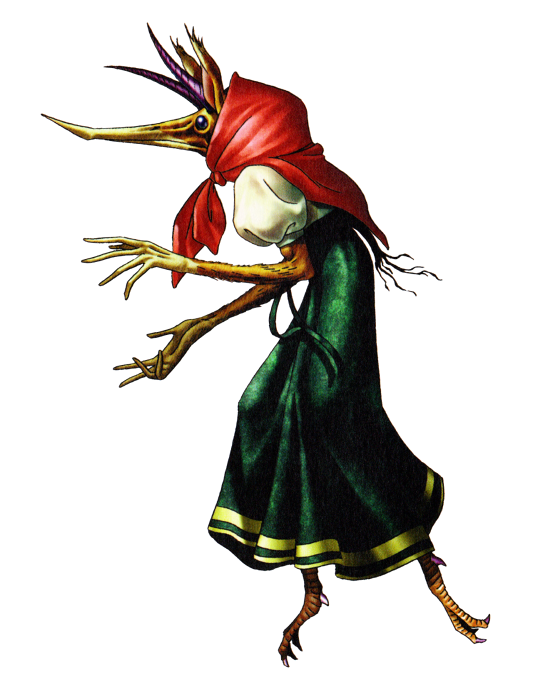 It actually has a lot in common with the Japanese Kappa, and this design really feels like some other country's equivalent to the river youkai. I love the combination of somewhat turtle-like shell, fishy body and a snout like a desman, which is a type of swimming mole you need to google immediately. There are, of course, plenty of heavenly and angelic beings as "demons" in this series, though they're actually using the wrong name here. 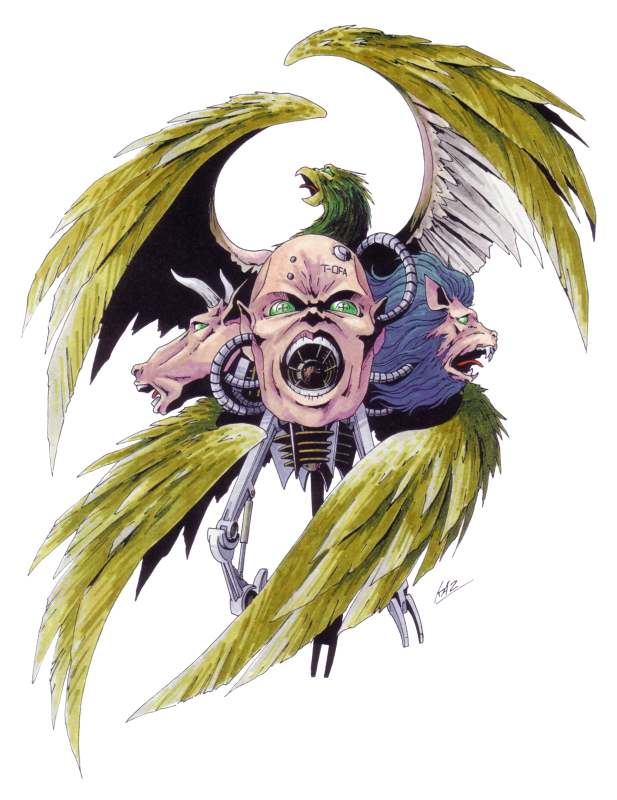 Ophanim are the many-eyed wheels that appeared alongside these beings, the Cherubim. What? You thought Cherubim were little baby people? Ezekiel described each as having four bronze wings and four different faces; the face of a man, an ox, an eagle and a lion. 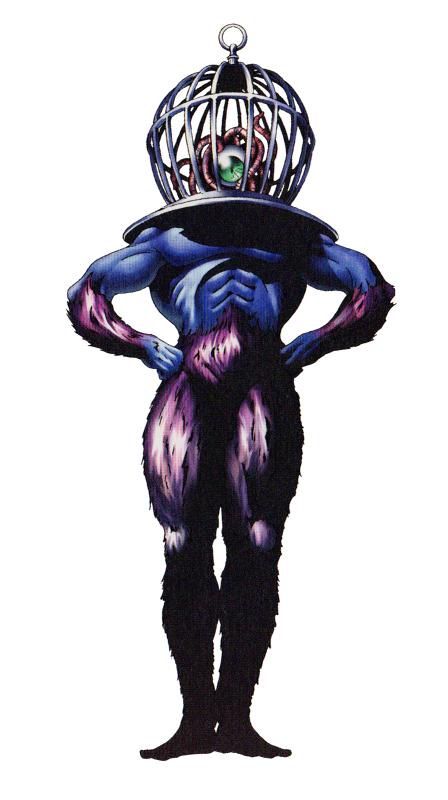 Megami Tensei's only addition are the cyborg parts, which really don't feel at all out of place anyway. This Chinese monster is said to have a large mouth, a head colored like a gourd, and sometimes only a single leg. I'm not sure why they dropped the one-legged aspect here, but I do like the literal gourd head and the visible skeleton! We already saw an over-the-top Lucifer, so here's an over-the-top Satan, treated as a separate demon entirely. This guy has it all; a gigeresque alien head, fish fins, a snake's tail, a skull face, almost beetle-like wings, suckered tentacles that are also made of bone and multiple sets of tiddlies. Just about the only thing monstrous feature this Satan doesn't have, and rather glaringly I might add, is any additional number of heads or faces, but we'll let that slide for the sweet as hell bone tentacles. The name here comes from a Haitian goddess of fertility, but the design seems to come from the Venus of Willendorf, a tiny clay figurine dated around 30,000 BC. 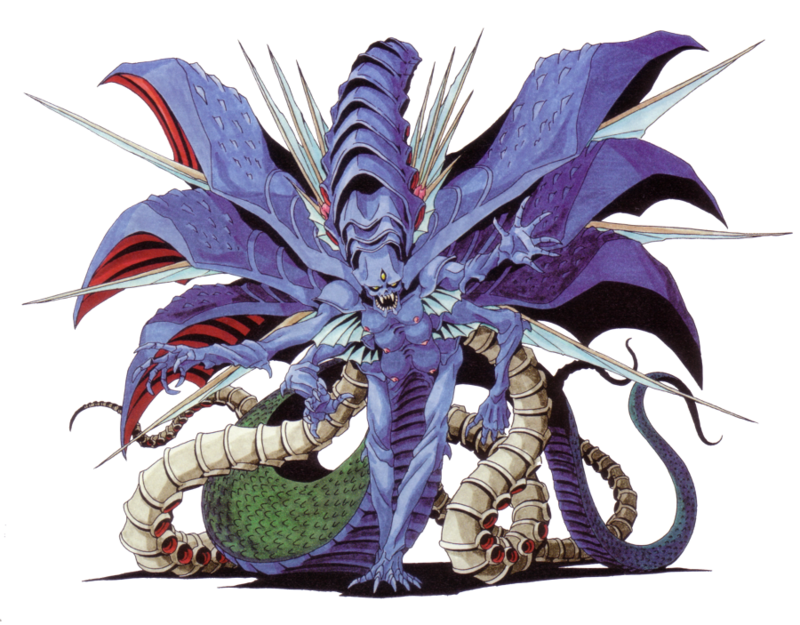 Megami Tensei's design is spooked up with a couple of snake friends and purple skin, but strangely, it has far smaller breasts. I'm kind of perplexed that Megami Tensei would miss any excuse to give something a positively tremendous rack. My mom actually went through a long period of making clay pottery when I was a child, and kept making her own replicas of these things in different colors and styles. I knew these were called "fertility idols" or "fertility goddesses" but didn't fully understand the meaning of those words, nor did I understand that it wasn't just an everyday hobby a lot of adults dabbled in, so of course I'd casually mention my mom's Fertility Idols like they were the most normal thing in the world around other parents and teachers. 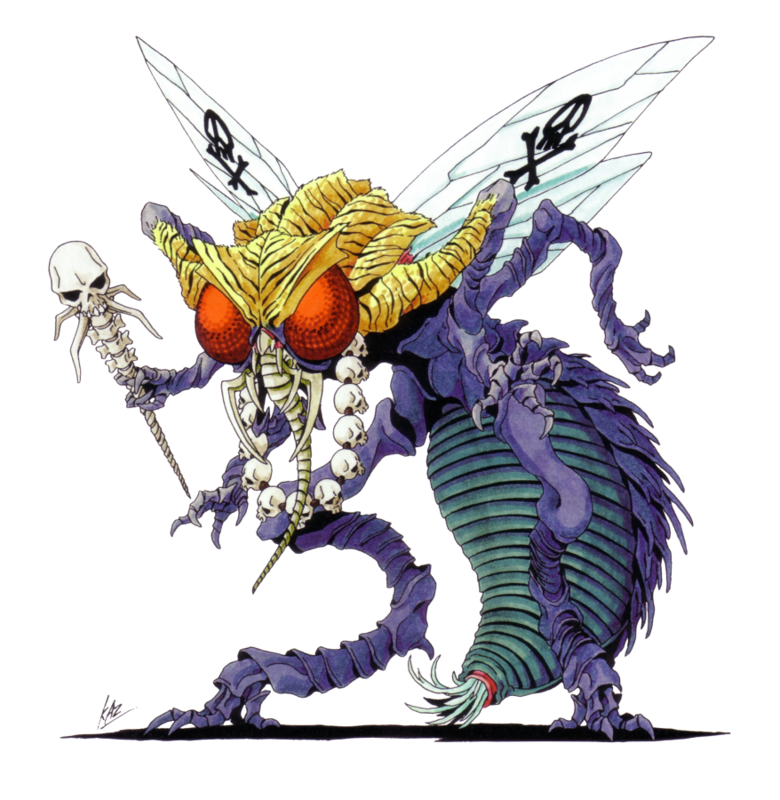 I wrote an entire article once about the many different takes on this fly-like demon. Originally, Beelzebub was just a mean pun Christians came up with to mock the "pagan" god Ba'al, twisting his name to mean "Lord of the Flies" as if to say he was the god of a dung heap. 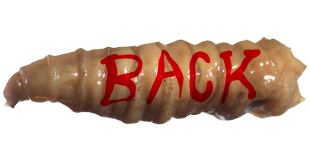 Eventually, this rude pun was recorded as the name of an actual demon fly, and fiction has been running with that idea ever since. In this series, Beelzebub is given a huge, beastly design with human bone accessories and an inexplicable dash of tiger fur, I guess just translating from his human disguise as a man in bones and animal skins. He's also featured in basically every single game and is one of the most powerful demons you can summon to your side. That a fly would be such a big deal is definitely up my alley, though I have to say, I still like Druj from our last page very slightly more. 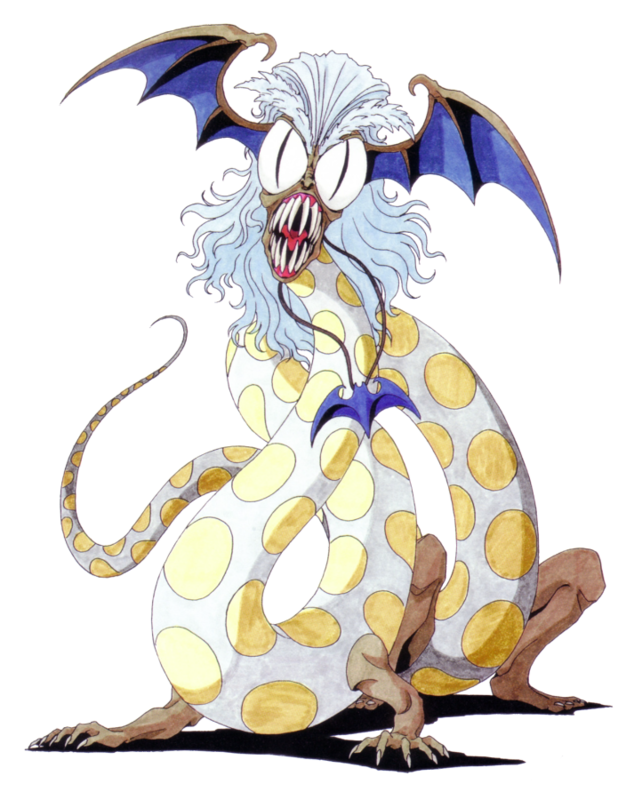 You can't copyright the name of a star and the Ghost With the Most can take any shape he wants, so here's just straight-up Beetlejuice in Megami Tensei, closely resembling his snake form from the Burton film and missing only his black and white stipes! This thing is actually pretty damn scary, too; Beetlejuice was meant to be a darker horror film before Burton got ahold of it, and I could have still seen BJ (teehee) as a more serious villain, but... I'm glad the movie continuity was thrown out and forgotten by all in favor of the superior cartoon version. I think...this is the one. My favorite design in the series. 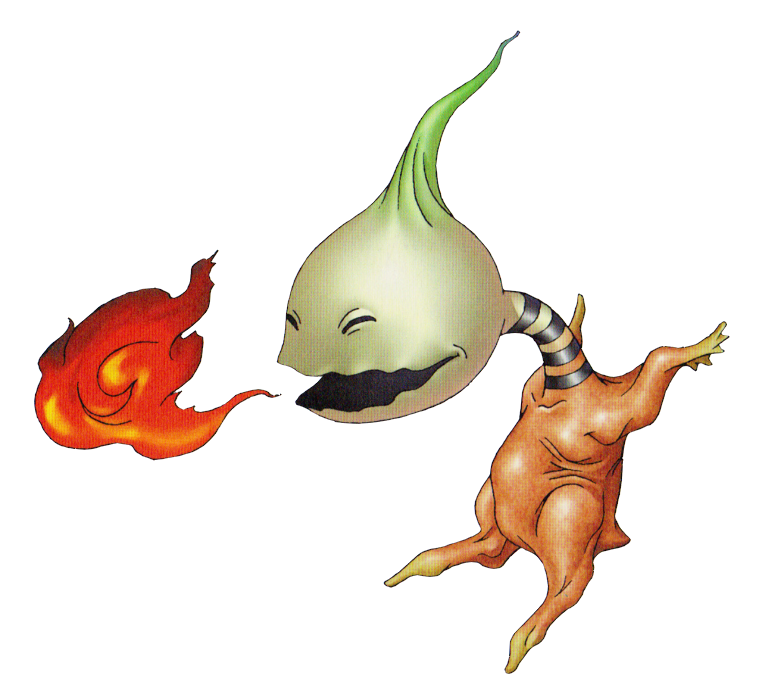 An Onmoraki is usually just a very unpleasant, bird-like youkai with a few scattered human features and fiery breath, but here, it's a horrible ghostly onion-head on the fleshy, awful body of a plucked chicken. It's a wonderfully unique interpretation with all the trappings of a marketable series mascot, but doesn't really break the fundamental idea of what this monster is supposed to be. I can almost too easily see this design in unsettlingly life-like stop motion. We can't rightfully end these reviews on anything else, can we? You knew, if you knew anything about this series, that we would get around to the Far-Too-Jolly Green Giant here. Mara is originally an evil figure in Buddhism, representing "unwholesome impulses" and unhealthy desires. There's nothing anywhere about him, or something her, being a big massive gigglestick, but I won't argue that it doesn't fit the concept, and this particular depiction of the doodledinger has a color scheme I find downright gorgeous and just a very satisfying design overall, from the splotchiness of the pale green flesh to the bulginess of the purple veins. 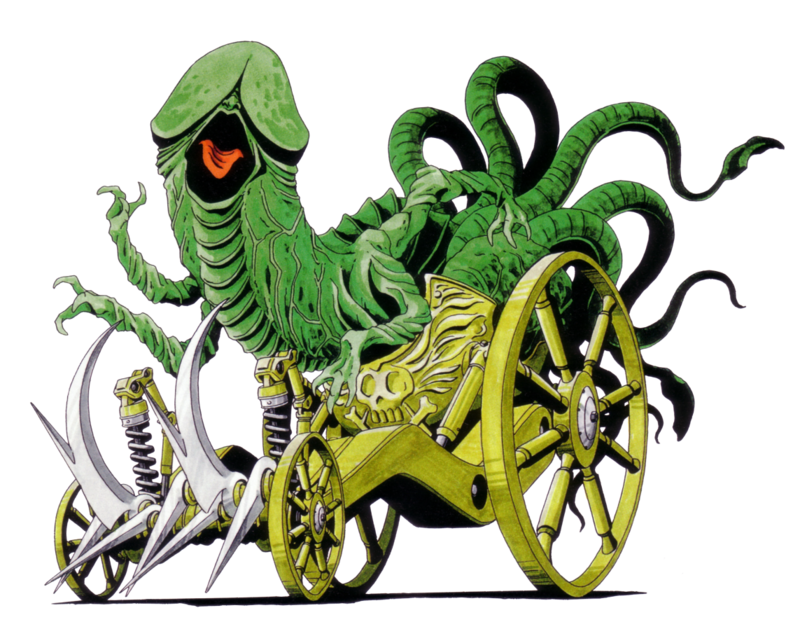 This, however, is Mara's more common and more famous design throughout the series, greener and scalier with multiple little clawed arms and a bladed chariot you really, really don't want to be driven around by a huge dingleheimer, either for your sake or theirs, because it REALLY looks like Mara's gonna topple forward at any second. So...is this it? 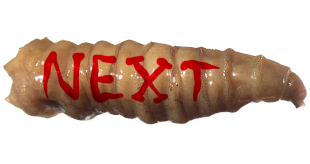 Is this the note we end on? I'm not sure I can think of anything better. 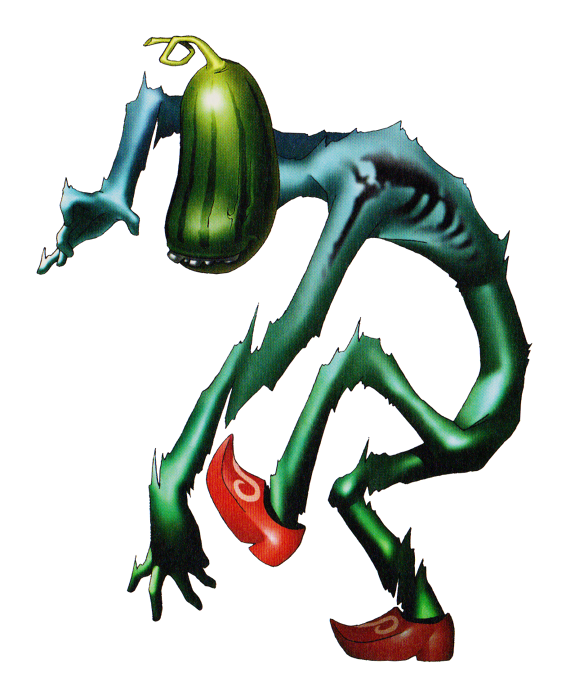 The first time I even said I was going to review demons from Megami Tensei, a few people basically said "oh, it's the game with the big green boingus." So, yes. This is all we were building up to.